On any given afternoon, you can walk into Satellite Med and find a bustling clinic full of nurses, doctors, technicians, and patients waiting to be seen. The privately funded, faith-based medical center has been around for a decade and sees around 700 patients a week – by appointment and for urgent care. Speaking of appointments, you can visit Satellite Med for non-emergencies too – Dr. James Cates specializes in sports medicine and is a family practitioner, and Dr. Christopher Dill is in-house for pediatrics and internal medicine. Dr. Kenna Williams is the surgeon on board. If you do have an urgent care need, chances are you’ll visit with Dr. Carol Berg or Dr. Matthew Bolton. We were surprised to discover the range of services offered at what appears to be a smaller operation – there’s an on-site lab, medication dispensary, allergy clinic, flu clinic, and a sleep studies department. Need to look below the surface? They can help you with x-rays, CT scans, and ultrasounds. As a business owner, you could decide to use Satellite Med for your personal and business needs; setting up a business account makes billing for services easy. They take care of worker’s compensation claims, standard pre-employment and DOT physicals, and drug screens. If your office is trying to get healthy and lower those insurance premiums, get in touch to talk about health coaching and weight loss. 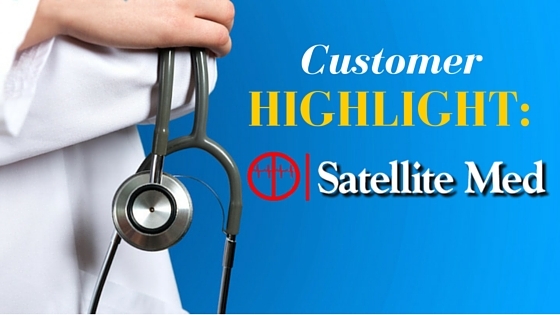 What sets Satellite Med apart from other clinics in town? Founder and CEO Dr. James Cates established the clinic out of frustration with the traditional medical system. Because they are privately funded, they can do things a little bit differently than other clinics – things like lower prices paired with a cash-fee schedule and encouraging patients by praying with them. Health tips from the people bringing us back to health? “We’re starting to see more cases of the flu lately, make sure you wash your hands well and come get tested if you’re feeling any symptoms – you don’t want to expose others,” says office manager McKenzie Raab. Satellite Med is open Mon – Fri, 7:00 am to 6:00 pm and Saturday from 8 am to 4 pm, including all holidays except Thanksgiving and Christmas day.